While we were originally attracted to the Fjordhorse breed because of the horse itself, as a result we have now twice traveled to Norway to visit the Stallion and Youngstock Evaluations, and in doing so we have also fallen in love with the country. Lori standing in front of the lovely restored Norwegian farmhouse at Nedreberg. Being in Norway, especially Western Norway where the Fjordhorse is from, is like being in a totally different world from what we are used to. First off, the views are spectacular and they are everywhere. Everywhere you look there are rugged mountains, sheer cliffs, deep clear blue water, gorgeous skyscapes of glorious puffy clouds, waterfalls, dark green trees, white snowcaps. The list of scenery goes on and it is endless. We found the Norwegian people to be very open, friendly and welcoming, and while the food is very different from what we are used to at home, it is quite wonderful, varied, and delicious. 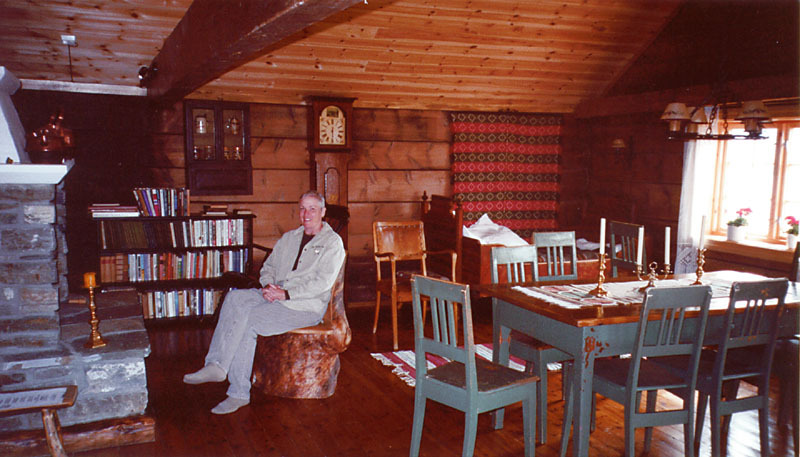 On our last trip to Norway one of the high points of our whole visit was having the great good fortune to stay at Nedreberg, the farm of Amund and Torild Nedreberg in Stryn (pronounced Streen). This farm has been in Amund’s family for many generations. There has been a farm at Nedreberg since the 14th century, and the farmhouse and farm buildings date from the 18th and 19th century. 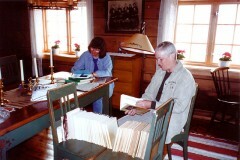 Torild shows Julie and Lori a book about Stryn. 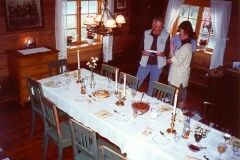 The dining table set for our traditional Norwegian meal is in the foreground. Amund and Torild have built themselves a new house up on the hill, and then restored the original farmhouse that had belonged to his family all the way back through the years. 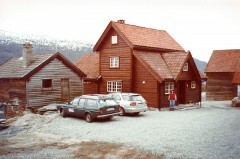 The restored farmhouse is now available as a bed and breakfast for visitors wishing to stay and experience Norway and the Norwegian culture. My husband Stefan and I were among the lucky group of first guests to use the house, staying there with our friends Julie Will and Darryl Wolford, and Peg and Doug Knutsen. 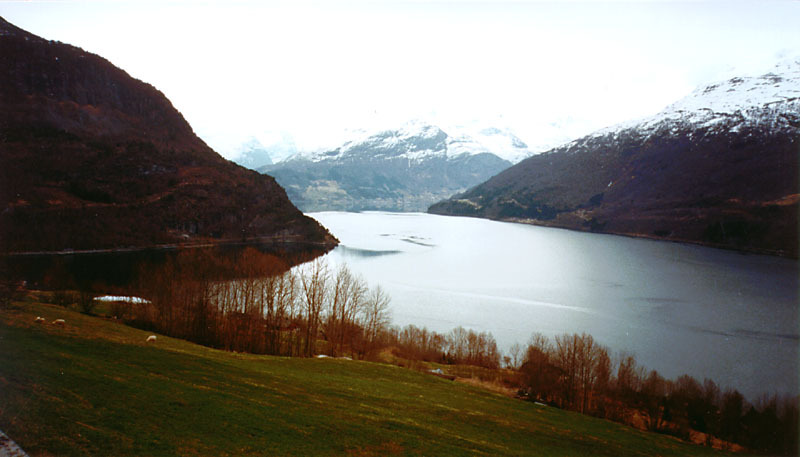 An extra bonus for us staying at Nedreberg is that Amund is a Fjordhorse breeder, as were his ancestors before him. What a wonderful opportunity to learn from someone with so much history of the breed! Amund had three Fjord mares in his barn, and one of them was Rånja, a Rådar daughter who was the dam of two of the top stallions in Norway. Rånnar (Enar x Rånja) won first in quality of the five year old stallions the year before our visit, and during our stay Rånn, a full brother, had the highest scores on the five year old performance tests and placed second in quality overall. This grand mare was expecting a foal during our stay – she was in foal to Kviablakken, a Felix son – and we were hoping to have the extra pleasure of being present for the birth. Julie sitting in the log seat in the living/dining room. Note the bookcase behind her which is full of studbooks and stallion catalogues. Heaven! We were totally charmed by the ambience of the restored farmhouse, which had all authentic and traditional flooring, wall coverings, decorations and furniture, in addition to the new modern comforts. Everything was so peaceful and the house had a relaxed aura that seemed to block out the worries of the modern-day world. Outside all the windows were the trademark Norwegian stunning views. Inside we had a full kitchen (stocked with breakfast foods so we could help ourselves before heading out to the horse shows in the morning) and a beautiful living/dining room complete with a stone fireplace, antique furniture, and framed photos of the ancestral family on the wall. There was also a laundry room with washer and dryer and full bathroom with shower on the main floor. Upstairs, which was accessed by means of a very steep staircase, almost a ladder, there were two bedrooms, one with room for two people and one with room for four, as well as a quaint slanty-ceilinged half-bath. 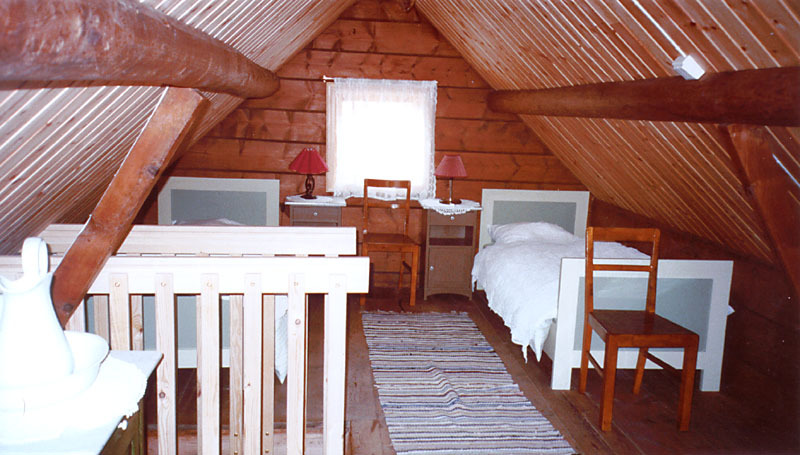 The upstairs (loft) bedroom with original beds - but lengthened to accommodate today's taller people. We asked Amund what he remembered most about growing up in our charming little farmhouse and he said “How cold and drafty it was in the winter”. We had a laugh at that because now that it is restored and modernized it is so nice and snug and comfortable. One of the exciting features of our house was the bookcase FULL of Norwegian Fjord studbooks, dating back well into the 1800’s. All these used to belong to Amund’s father and grandfather. We were in heaven! We put them all into order and then sat for hours, poring through, looking up the horses in our own horses’ pedigrees and making notes about what the studbook said about them: colour, measurements, and the evaluators’ comments (all in Norwegian of course, but we put together a little English/Norwegian glossary of common horse terms). What’s more, all the stallion catalogues and youngstock catalogues from each year’s evaluations were there too, complete with the marginal notations that Amund’s ancestors had made while at the show. For a group of Fjordhorse enthusiasts like us, this was a living history book and unparalleled opportunity. Lori and Julie hard at work researching in the studbooks. Amund and Torild were wonderful friendly hosts who made us feel very welcome and took the time to introduce us to Norwegian culture. One evening they prepared for us a glorious meal of traditional Norwegian foods. They set up the large table in our house with place settings for all six of us, plus themselves, two of their teen-aged children, Torild’s mother, and a local lady who came to sing the traditional Norwegian songs and tales during our meal. While we ate, the lady would take breaks from her own food to stand and tell us a little background about the song she was about to sing, and then she sang the traditional tales, with musical accompaniment provided by the Nedrebergs’ son. I can’t tell you how lucky and special we felt to be able to experience the Norwegian culture in this way. 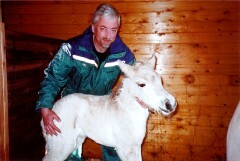 Our host Amund with Rånja's newborn filly by Kviablakken. From our home-base at Nedreberg in Stryn, we traveled on separate days to the youngstock shows at Førde and at Breim. Then, with some reluctance, we left Nedreberg to go to Nordfjordeid, where we stayed for the four days of the youngstock and stallion shows held there. There is nothing quite like being a Fjordhorse lover in Nordfjordeid at the time of the stallion show, as everything going on in the town seems geared to the animal we love, and the town’s population swells with a contingent of Fjordhorse lovers and experts coming from around the world. 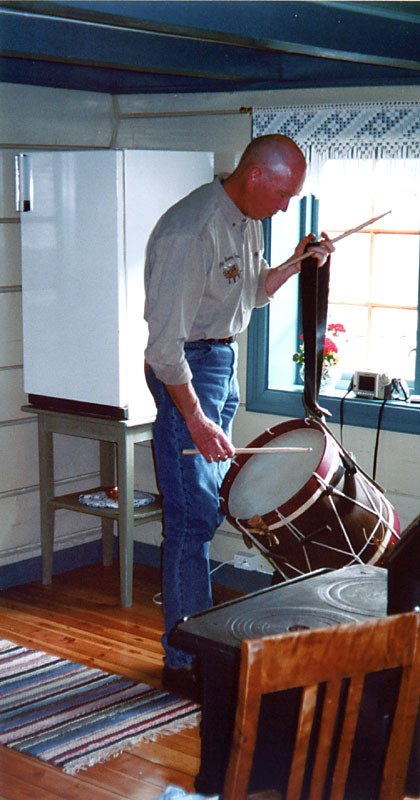 Darryl playing the drum that was used in traditional Norwegian storytelling and music playing. During our stay at Nedreberg, Amund spent a night or two sleeping in the barn, as Rånja had gone off her feed a bit and was showing signs of impending parturition. Unfortunately, we didn’t get called out of bed at night to witness any miracles. However, on our last day in Nordfjordeid, Amund came and told us that Rånja had foaled a beautiful healthy filly. Amund was very pleased with the filly, saying she incorporated the best features of both Kviablakken and her dam, just what he had been hoping for. After we left Nordfjordeid to make our way back to Oslo, and from there to home, we stopped at Nedreberg to see the lovely new filly, a grand-daughter of the stallion Felix, who now stands in Ontario and is contributing to our own breeding program. One of the many beautiful views from the Nedreberg farm. While at Nedreberg, Stefan and I enjoyed the opportunity to hike on the trails leading up the mountain from our farmhouse. We climbed up and up through rocky outcroppings and evergreen trees, stopping every now and then to admire the beautiful vistas behind us. We had been told about the milk house which was a small house way up the mountain where the cows were taken to summer pasture and usually a girl would go up there to stay and milk them. We decided to try to walk up to see the summer pasture milk house. We walked for a long time, but we didn’t make it. We later found out that it was quite a ways further! One day we would like to return to Nedreberg and ride the Fjordhorses up to the summer pasture. To anyone planning a visit to Norway and wishing to learn about and experience Norwegian culture, I would heartily recommend getting in touch with Amund and Torild Nedreberg (they both speak excellent English). They have a website at http://www.nedreberg.no. Yes, we are Canadian. But don't worry, bringing a horse into the USA from Canada is no big deal! There is no tax or duty to cross the border. All that is required is a current Coggins and an International Health Certificate (which we provide).